Count me a fan of Smoque, friend and fan of Barry Sorkin and the place in general. While I've not had a bad meal I've never been exuberant, with the possible exception of the Texas style sausage. about any particular item, its always been a 'whole is greater than the sum of its parts' experience. Tonight Smoque's brisket, moist, smoky, tender yet still retaining structural integrity, changed that and jumped near the top of the commercial BBQ heap with, of course, the exception of Cooper's in Llano, TX, where god goes when she's in the mood for brisket. I've been going to Smoque since week one and each and every time the BBQ gets a little better, not an easy trick when you have people lining up night after night. Kudos to Barry, Mike, Al and staff. 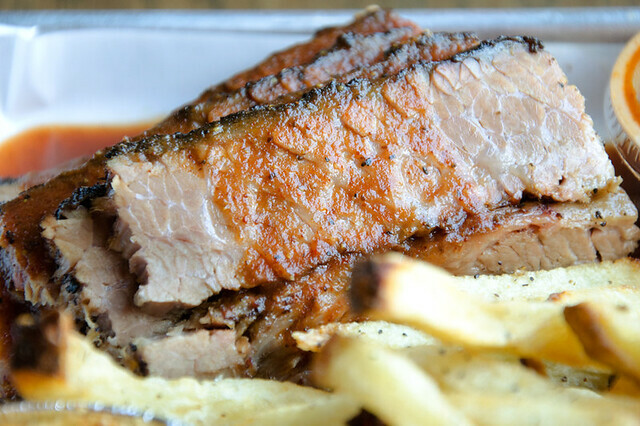 Just look at that brisket. Wow just wow. Took the day to look at wedding venues (please kill me now). Had the opportunity to have lunch at Smoque. Both their mac n' cheese and brisket were the best I've ever had. Last edited by incite on August 17th, 2011, 2:10 pm, edited 1 time in total. incite wrote: Took the day to look at wedding venues (please kill me now). Had the opportunity to have lunch at Smoque. 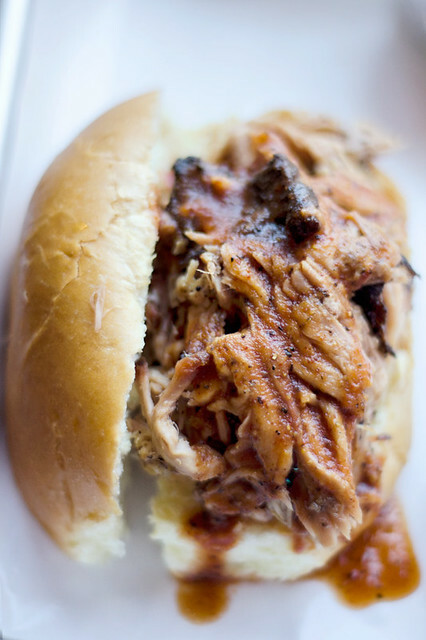 Have you considered using Smoque as your wedding caterer? I did it last year and they were awesome! No, I had no idea, but I'm calling up the fiancee right now. If this doesn't work out, I definitely need to take a look around LTH to see what else is available (and affordable). As the father of the bride above, I can tell you it was very affordable--not cheap, but very affordable. Plus, without exception, guests said it was The Best Wedding Food Ever! They serve buffet style and bring more food than you can imagine. So, if you use them, make sure to clear your freezer (and possibly a friend's, too) before you leave for the ceremony, 'cause you're gonna fill it up with leftovers when you get home late that night! Talking about the fiancee or the BBQ ? Or is one dependent on acceptance of the other? Best of luck with your wedding planning--at least the menu and beverage tasting(s) are fun! boudreaulicious wrote: Talking about the fiancee or the BBQ ? Or is one dependent on acceptance of the other? Carry-out lunch for the office from Smoque this past Friday was superb and made me appreciate, once again, how remarkably consistent the food quality is at Smoque. For our group, we ordered just about everything on the menu . . . except for St. Louis ribs. When I called to place the order I was informed that, "due to quality issues," St. Louis ribs were not available, and that they hadn't been for a couple of weeks. When I picked up the order I asked Barry Sorkin about it. He told me that because pork belly pricing is currently so high, spare ribs are being trimmed extremely closely, in order to increase the yield on bellies. As such, the layer of fat that normally resides atop the spares has been MIA. 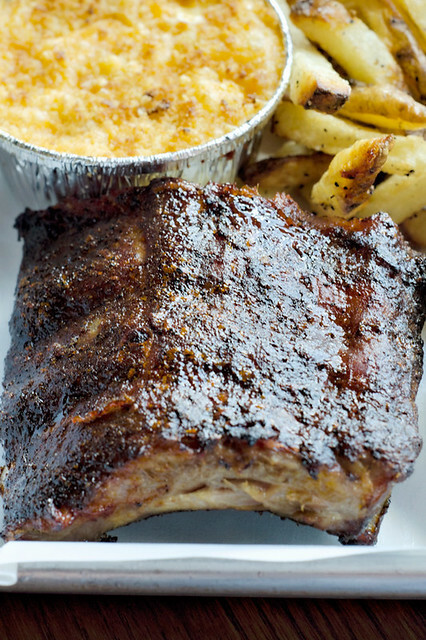 The result is ribs that dry out during cooking. When Smoque couldn't get spares that met their standards, they pulled them from the menu. Since then, they've been working with their supplier to find a processor that can provide spares that make the grade. About 10 samples have already been tested, and they now believe they've identified an acceptable source for the spares. It's likely that they'll return to the menu soon. 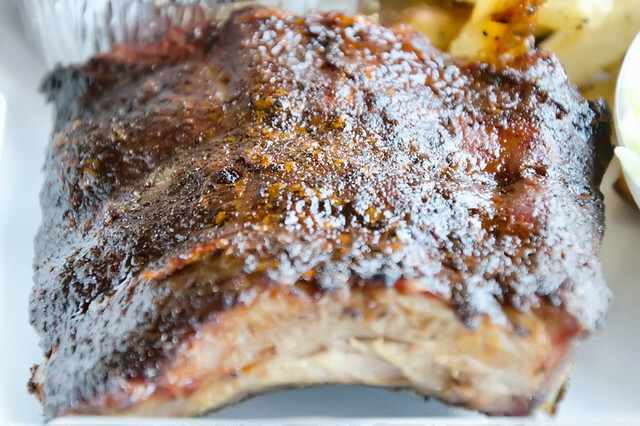 Personally, even though I was in the mood for St. Louis ribs, I thought it was great that when they had a product there weren't happy with, they pulled it. There aren't many places that would do this and I think it speaks volumes about why Smoque has become as successful as it has. There's a level of care here that one doesn't find often enough and it's refreshing to see. I wish more places cared this much about the food they're serving. ronnie_suburban wrote: Carry-out lunch for the office from Smoque this past Friday was superb and made me appreciate, once again, how remarkably consistent the food quality is at Smoque. For our group, we ordered just about everything on the menu . . . except for St. Louis ribs. When I called to place the order I was informed that, "due to quality issues," St. Louis ribs were not available, and that they hadn't been for a couple of weeks. Thanks for sharing Ron. That does seem rare, and as I think about it, I guess it shouldn't really surprise me. The care they show is always evident the minute you walk in the door. They are polite, make sure everyone can find seating, the place is always remarkably clean for a place doing their volume of business (and selling bbq) and the food is great. 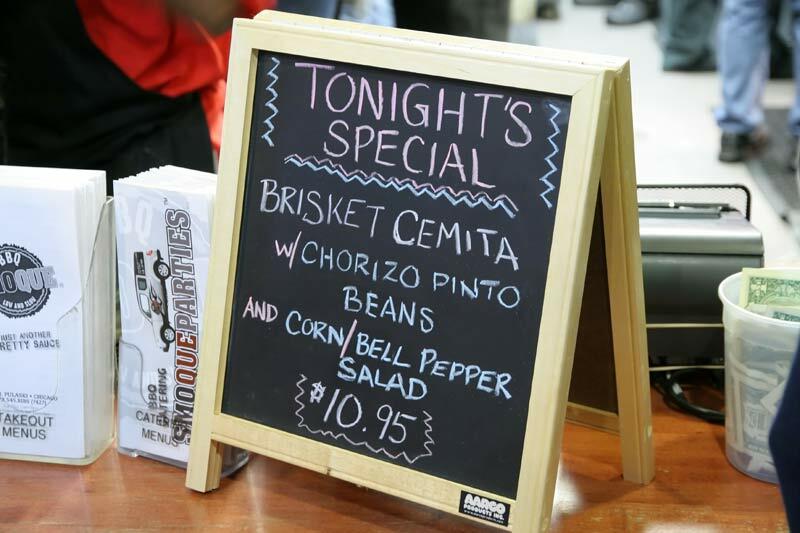 Now if they can just get that pastrami from the GCM BBQ event on their menu! I wasn't sure whether I should post this here or on the Cemitas Puebla thread but since the venue is Smoque, this seems like the right place for it. On Tuesday November 1, these 2 GNRs will team up for a Cemitas Night at Smoque BBQ from 5-9 pm, during which Brisket Cemitas will be offered. The cemitas will be Cemitas Puebla-style and the brisket inside them will be Smoque's. From what I understand, Barry Sorkin of Smoque and Tony Anteliz of Cemitas Puebla will both be on-hand during the event, which represents some of the greatest local dining cross-pollination I can remember. It'll be a busy week for me but I hope to stop by on Tuesday evening and eat a cemita or 3.
ronnie_suburban wrote: I wasn't sure whether I should post this here or on the Cemitas Puebla thread but since the venue is Smoque, this seems like the right place for it. Oh, man two of my favorites! I really hope I can make this. Thanks for the heads up Ronnie. Just wait for the Sole Fillet In Spicy Szechuan Sauce fish tacos at Big Star next month. En serio, I'll be there at 5:30 Tuesday. Can't wait. A shiny nickel says they run out in under an hour of either brisket or that chipotle pineapple salsa concoction - if they actually have any of the salsas. I'll probably miss this. Sorry, I'm mad - just venting a lil. seebee wrote: A shiny nickel says they run out in under an hour of either brisket or that chipotle pineapple salsa concoction - if they actually have any of the salsas. I'll probably miss this. Sorry, I'm mad - just venting a lil. Wow! Your bitterness has caused you to throw these guys under the bus days before the event even happens. Tough crowd. Admittedly, totally guilty as charged. I'm outta town, and getting back Tuesday night. Ugh I thought this was tomorrow and am now home! That stinks. 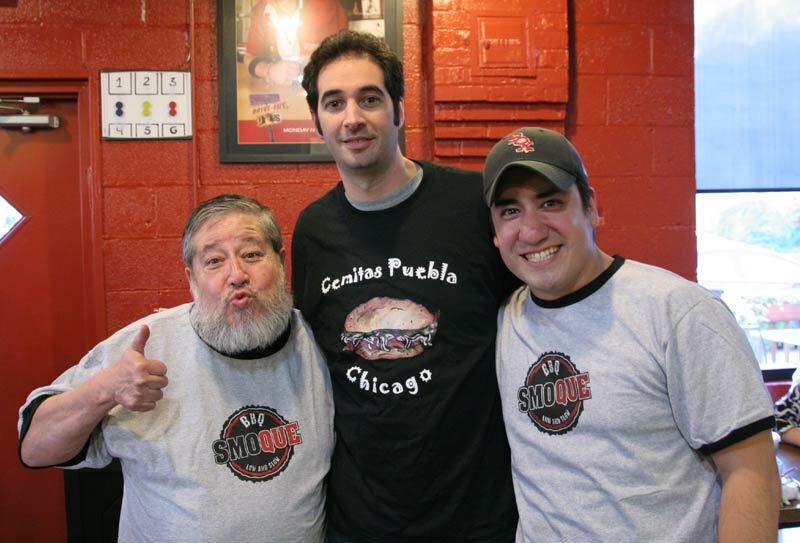 Not surprisingly, the dynamic duo of Smoque and Cemitas Puebla turned out some pretty awesome cemitas on Tuesday night . . . Delicious and wonderful. The combination of smokey chipotle and unctuous brisket was a righteous one. It was quite busy, especially for a Tuesday evening and there were a bunch of LTHers on hand, as well. The idea for this special collaboration was actually conceived by a brilliant guy named Ryan, who follows Barry and Tony on twitter. He suggested they do something together. He was in the restaurant (I stupidly neglected to take a picture of him) and I told him that whatever he comes up with next, I'm there. I have to disclose that I received my meal for free. I didn't know this would be the case going in and suppose it was because I am a frequent customer and friend of the house. I also made it out to Smoque for the Brisket Cemitas last night. Even though I couldn't eat in and had to get a carry out, it was still near-perfect. Its been far too long since my last visit to Cemitas Puebla, and I forgot how much I enjoy their bread and Oaxacan cheese. I thought the sesame bread married beautifully with the smokey, fatty brisket. The corn salad cut through the rich sandwich as well, although I was a bit disappointed with the chorizo pinto beans. I didn't detect much chorizo flavor in the beans, and instead had large pieces of bacon skin. It was great meeting a few LTHers for the first time. I'm just sad that this special was only for one day! I logged in both eager and anxious to see if anyone posted any updates to this thread. I'm now even more angered that I missed it, yet hopeful it will happen again. Were the full compliment of salsas offered? 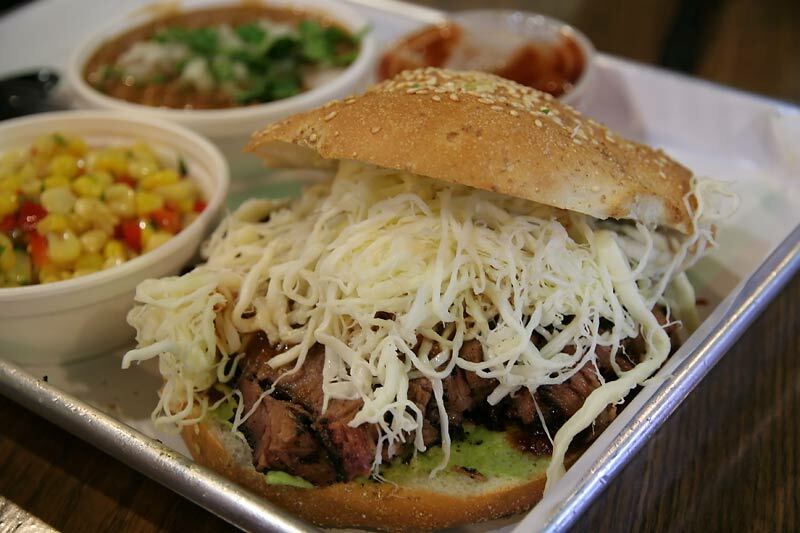 I swear I can taste a brisket cemita dripping with their salsas right now. For those that missed it, Tony (Sr.?) told me that they would be doing this again at Cemitas Puebla in a couple weeks. Also, I did not see any salsas available, but I don't think it was needed at all. When you take terrific, flavorful and unctuous brisket and put it on a fantastic, perfect-textured roll, you get a hell of a meal. I very happily polished off a whole one of these massive cemitas last night. That said, I hope they improve a few things for next time. First, I do think the sandwich needed something acidic to cut through all of that fatty richness. Maybe some of CP's table salsa, maybe some of Smoque's vinegar-based dip, maybe just some lime wedges on the side. Maybe all or none of the above. But something for sure. Second, I thought the corn-pepper salad was bad. It had almost no flavor, and the textures added nothing to the meal. 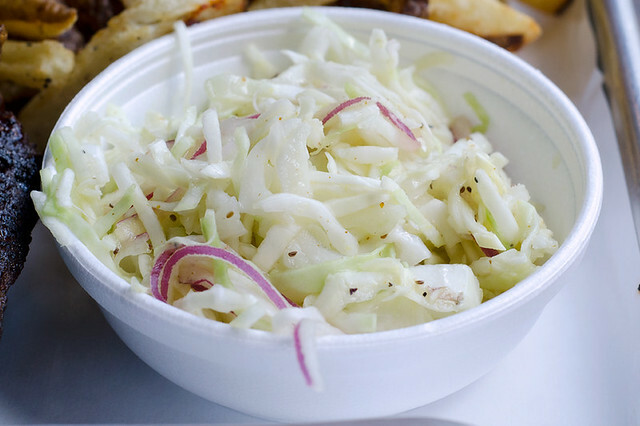 I would have greatly preferrred some kind of crunchy, tart slaw. It shouldn't be too hard to come up with a slaw that fuses in some Mexican ingredients or techniques. Finally - to echo a comment above - the chorizo in the chorizo beans was too subtle for me. A little more chorizo spice would have helped the meal. I was fortunate enough to make it in last night for the Brisket Cemita -- somehow convinced my better half that driving out of the way to bring our 2-year-old and 3-month-old would be a good idea. Thankfully the line wasn't too crazy around 6:30 (not quite out the door) and the kids did okay. As always the staff was more than gracious and accomodating to our needs, and with my toddler enjoying the mac & cheese we were able to enjoy the meal without too much of a rush. The atmosphere was definitely electric and somewhat surreal -- there was definitely a nervous energy I sensed from everyone working, particularly the folks from Cemitas Puebla who were so intent on making sure the night was a success. Tony Sr. was working the line while Barry worked the room (as usual), while Tony Jr. was watching everything, eagle-eyed. I was really loving the communal vibe -- everyone in line and at tables seemed to have a sense that they were experiencing something special together. Lots of table-to-table conversations and knowing looks between patrons. At one point I started explaining "Tacos Arabes" to a gentleman at the next table, and a guy two tables over was like "YES! Tacos Arabes are so awesome!". If ever there was an occasion for high-fiving about the food at a dining establishment, this was it. To answer seebee's question above, the cemita was served only with the chipotle salsa -- though I didn't ask whether any of the others was available. They served it in Smoque's plastic BBQ sauce cups; I actually would have preferred the squeeze bottles to allow more "precision saucing", if you will. But it was definitely the real, good stuff. Side note: I actually tried some of the Carolina sauce (from my toddler's kiddie pulled pork) on the cemita, and that was pretty darn good too. So here's my opinion on the Brisket Cemita. First off, obviously it was delicious. Really, how could it not be? But after thinking about it for a while, I would describe it as "exactly the sum of its parts". This is not meant as criticism, but it didn't really open my eyes to what a cemita from Cemitas Puebla could be, and it didn't give me a new appreciation for how Smoque's brisket could be leveraged as a sandwich filler. I think both the cemita (particularly the atomica) and the brisket stand so well on their own that last night felt more like a really cool and fun indulgence -- a novelty rather than something revolutionary. But I think that was kind of the idea all along, so I commend everyone involved for a great evening! ronnie_suburban wrote: The idea for this special collaboration was actually conceived by a brilliant guy named Ryan, who follows Barry and Tony on twitter. He suggested they do something together. He was in the restaurant (I stupidly neglected to take a picture of him) and I told him that whatever he comes up with next, I'm there. It so obviously needs to be smoked brisket and hot kimchee with a starch (perhaps in sammich format as well?) Tell him to make it happen. seebee wrote: It so obviously needs to be smoked brisket and hot kimchee with a starch (perhaps in sammich format as well?) Tell him to make it happen. Needless to say, I'm sorry to have missed this. Looks awesome, and how can it not be? Two of the best casual eateries teaming up? I wish these sorts of crosstown classics would happen more often. I know Gaetano's and New Rebozo out here frequently collaborate. Certainly it's a way for different chefs to challenge themselves and all of us in the process to (hopefully) benefit from the results. I guess it's fairly telling that I failed to mention the sides. 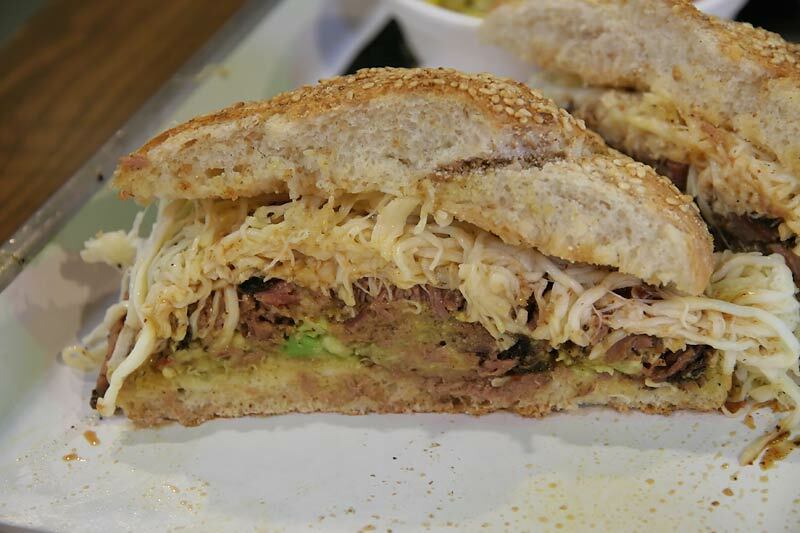 A big part of that was because the cemita really stole the show. The bread was as crispy and tender as it ever was, the brisket was tender and flavorful, and I really enjoyed the chipotle salsa that was served with it. I loved the beans, though, and the pronounced hit of fresh cilantro in them was great. But I more or less agree with Kenny about the corn salad. It was somewhat bland and pretty mushy. That said, I loved the idea of the collaboration and the way it was pulled off. I look forward to the next incaration, whenever it is. 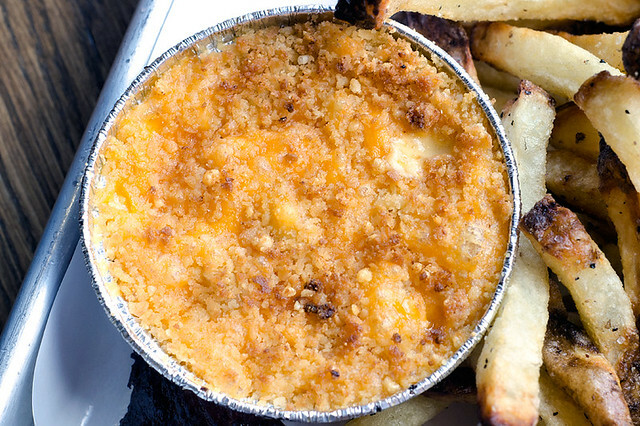 Smoque is featured this week on the Check Please restaurant review show on WTTW. 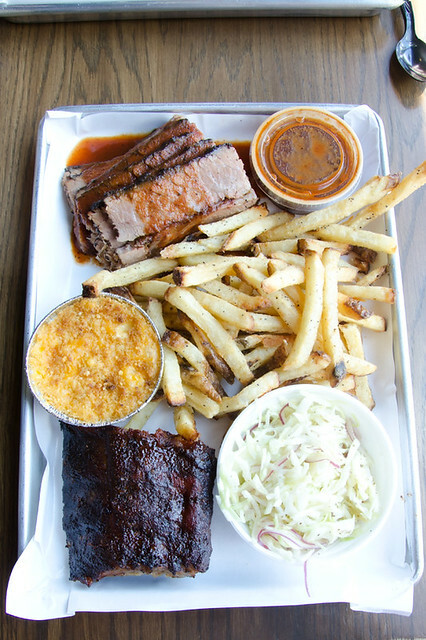 All three reviewers, one of whom was Steve Dahl, gave high praise to the food at Smoque. Steve said, and I agree that they have the best french fries anywhere. You know what I thought oddest about that Check Please panel? Two of the three guests were totally unfamiliar with BBQ! In fact, the guest who picked Smoque was apparently introduced to BBQ by Smoque. There's something tragic about that, I know - being introduced to 'Cue late in life, not being introduced to Smoque - but also oddly inspiring that one of the greatest, most pervasive and most beloved of American cuisines can be discovered by someone so relatively late.